Finding that special ingredient that makes your brand irreplaceable is tough work. If you don’t put yourself in the shoes of your customer, that job turns from tough to impossible. Think of your own life. 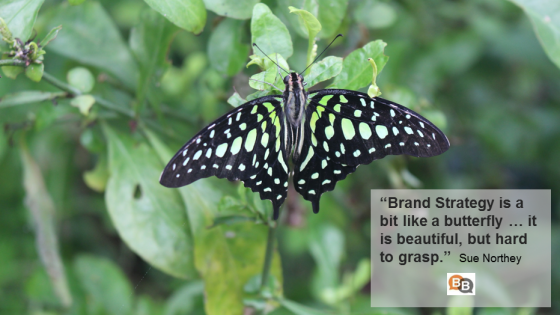 Which brands are such an important part of who you are that there are no brand substitutes? As I went through this exercise myself, I immediately thought of the 2012 Excedrin recall. That devastating recall in which every single bottle was removed from every single shelf in every single state. Excedrin is my standby. It is the medication I turn to when migraines put my head in a vise and won’t let go. For me, there is just no substitute. I frantically searched through purses, suitcases and drawers stockpiling Excedrin so I could manage to cobble together a cure until that jubilant day when the brand magically reappeared on shelves. 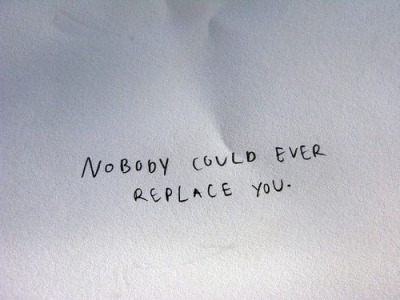 I thought about the other brands in my life that are irreplaceable. 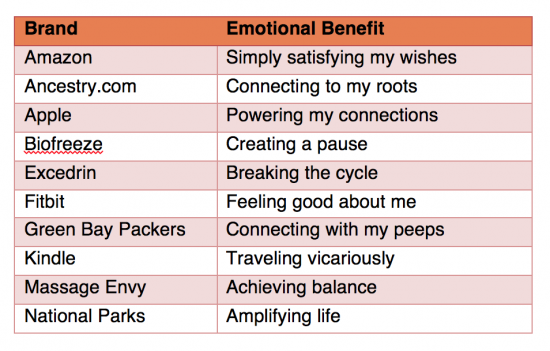 What emotional benefit does your brand promise its customers? 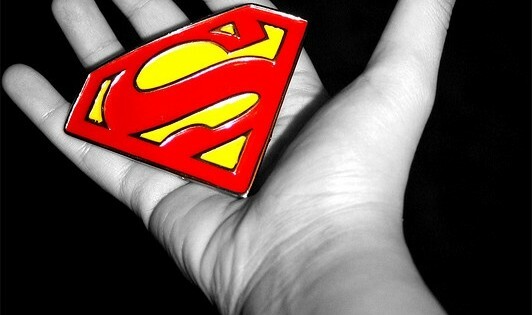 The Passion Play: What Is Your Brand’s Kryptonite? Do you have any passion brands in your life? By passion brands, I mean those brands you cannot imagine living without. Brands that would leave you brokenhearted if they were to disappear tomorrow. As I think of this question in my own life, I can only think of three: 1) Excedrin Migraine (absolutely nothing works as well on a killer headache); 2) iPhone (my life is tethered to so many apps that I would have a hard time functioning without it); 3) Long Tall Sally (they offer fashionable clothing that actually fits my long limbs). When you think of the hundreds of brands I interface with every week, it’s hard to believe that only three have achieved this status in my life. But, I bet you don’t have a whole lot more in your quiver either. 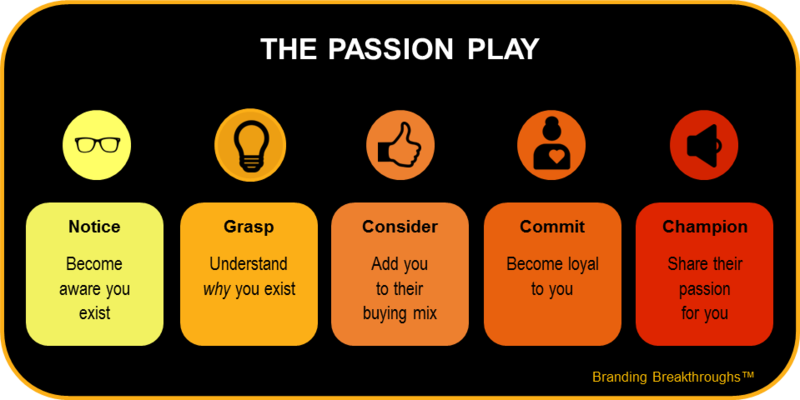 As a marketer, your driving goal should be to catapult your brand to passion status for as many of the individuals in your target market as humanly possible. An irreplaceable brand creates a shortcut to consumer decision-making. This is a real advantage to time-starved consumers. It also means there is no wiggle room for another brand to sneak into your target’s hearts and minds. That’s an advantage to your bottom line. 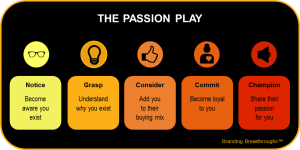 But, while becoming a passion brand is an aspirational goal for all marketers, it is far easier to wax poetic about its benefits than it is to accomplish. So, just how do you go about making your brand a passion brand? I am sorry to burst your bubble. There is no secret black box or magical crystal ball that can circumvent knowledge, investment and hard work. Your brand must intercept the target at numerous points along the decision process, earning their attention, teaching them what makes you special, encouraging them to consider you and ultimately buy you and then creating such an incredible brand experience that they must tell others about you. That is the magic behind The Passion Play. First, of course, is to get people to notice you … to become aware you even exist. As you well know, the old adage of “if you build it, they will come” never really works nor does tweeting a few posts or announcing a new product on your website. The most important way to get noticed is to figure out who your bull’s eye target is, where they live, work and play, what matters to them most and what emotional benefits they are seeking from your brand. Only then, can you connect with them in a meaningful way. Once you are noticed, you have to help your target grasp who you are at your very core. 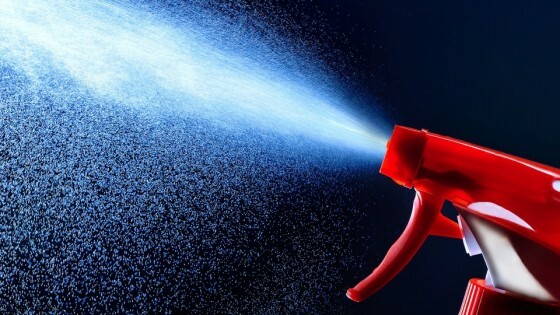 They need to develop a crystal clear appreciation for your point of differentiation versus your competitors. This phase answers the question: What is my kryptonite … my secret substance that no one else has? Despite some not-so-complimentary opinion pieces on how flawed qualitative and quantitative research is, designed properly there is no substitute for getting close to your target and understanding what makes them tick. If you are available where your target usually shops and you are offered at a price they consider a good value, they will finally commit to trying you. Here’s where the rubber meets the road. This is where the value proposition needs to deliver against customer expectations. If the product underdelivers, you will not earn the privilege of repeat purchases. If the product overdelivers, it is not achieving its full market potential. The optimal scenario is to perfectly match the performance of the product with your target’s expectations. Only then, will you achieve maximum trial and repeat. In decades gone by, a marketer’s panacea was to achieve brand loyalty, but today the goal is to inspire your target to become a champion for your brand. To create a customer that is so passionate about your brand they must share their brand experience with others. They may do this more publicly, through Twitter, Facebook or their blog, or in the shadows where interactions are not as easily tracked, in face-to-face conversations, texts or emails. These are the most passionate of the passionate, the individuals you can invite to participate in your brand. Making the progression from awareness to brand champion can be a lengthy and expensive process, made only more arduous if you do not have a sense of the essence of your brand and a clearly defined profile of your bull’s eye target. So, start this journey by doing your homework. Just like in the classroom, if you don’t do the work, your chances of making the grade are slim. We have all seen it … the brand that is all over the map when it comes to their communications messaging. They rationalize that everything they are saying is true, so why not say it? Aren’t they selling their product short if they don’t communicate all the reasons why their product is the best? At first blush, it makes sense. Why dilute your message and run the risk of losing prospective clients that might buy because of one of the many things you tell them? In truth, reality suggests the exact opposite. Too many messages can and will dilute the equity of your brand. It leaves consumers adrift, wondering who you really are and what you have to offer. In a simple word, it confuses them. When a consumer understands who you are, they understand what they can expect from you … every single time they interact with your brand. In the absence of consistent brand messaging, they don’t know what to expect and, thus, are often disappointed with the brand experience. With no brand consistency, it is far too easy to turn to a brand that offers a clear brand promise. Let’s look at Jimmy John’s to understand this concept a bit better. I am sure that most of you will agree that one thing the U.S. didn’t need was another sandwich shop back in 1983 when they opened their first restaurant. After all, the local Subway, Cousins or Suburpia was satisfying the hunger pains of residents just fine. So, just how did Jimmy John’s progress from a seemingly unknown to one of the biggest providers of sandwiches in the country? Let’s think about the Jimmy John’s tagline for a moment. This tagline is brilliant in its simplicity. It clearly and succinctly describes Jimmy John’s point-of-differentiation relative to every other sub shop in town. The word freaky exemplifies its brand personality, while simultaneously describing just how fast they are. Anyone that has listened to a Jimmy John’s commercial, walked into a store or ordered a sub on the phone can tell you there is something about them that is just a bit off center. Rapid-fire speech. Offbeat personalities. Comedic exaggerations. Couple this with their willingness to deliver one lonely sub to your home or office in record-breaking time and the simplistic beauty of the Freaky Fast tagline and positioning takes on a whole new meaning. As a consumer, it’s an understandable and memorable brand promise. Every time you order a Jimmy John’s sub, it will be delivered in record-breaking time, with a healthy dose of brand spunkiness along the way. Another terrific example is General Electric, who is arguably one of the world’s largest and most diverse conglomerates. The task of creating a single-minded brand positioning for a behemoth company that offers a dizzying array of products and services appears to be an insurmountable task; yet, create a single-minded message they did. Whether selling multimillion dollar MRI machines to hospital administrators, slick stainless steel refrigerators to consumers or energy consulting services to businesses, GE issues a rally cry to its employees the globe over – we will only market those solutions that push the edge of convention. Does this mean they will never sell me-too products? Of course not. However, it does imply they will not spend money promoting products and services that don’t respond to their corporate challenge. Both of these companies, among countless others, demonstrate that single-minded messages that get all of us nodding our heads in agreement are the ones that viscerally connect with us. They leave us with a clear impression of who the brand is and what they promise to deliver on every single occasion we interact with their brand. That kind of clarity usually earns our vote in the best possible way … through the dollars we spend.